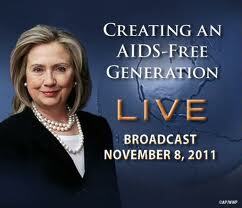 Secretary of State Hillary Clinton today called for a new approach to ending HIV– treatment as prevention. Clinton said the answer was clear. This administration has made HIV treatment and prevention a priority- in a way no other administration ever had the courage or the moral fiber to do. Just another reason not to go back to the Draconian Health Nightmare that was the Bush Administration by electing another Republican administration….